I only wish that I could visit the Tate Modern in London (the image on the left is from Tate) to experience the sheer beauty of Amrita Shergil‘s work. She lived a full life and like many gifted people died at the age 28. Such a dazzling life and so short! Amrita was born in Budapest in 1913 to a Hungarian mother and a Sikh father. She was educated in Paris and her confrontation with realism defined her style. One of her novice paintings earned a prestigious salon award. After marrying her Hungarian cousin, she settled with her husband in India and joined her family. 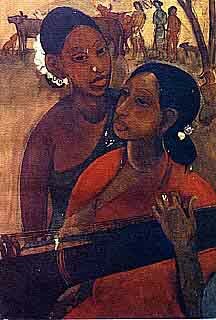 This was the beginning of a fascinating period in South Asian art as Amrita fused her European art instruction with the Indian locale thereby creating a wholly original and unparalleled stlye. The moods of India, its people started breathing into her works. This unique aesthetic was a turning point in the hisotry of modern art in South Asia. While in India, Amrita absorbed the ancient and immortal lines of wall paintings in Ajanta and Alora and such other cultural motifs. Pictures of Amrita and her self portraits (such as the one below right) also show how attractive and reflective she was. Her passion for art and life was remarkable. In India and particularly in Lahore she was an associate of famous people and most of the intellgentsia of pre-partition India had something to say about her once she was no more. 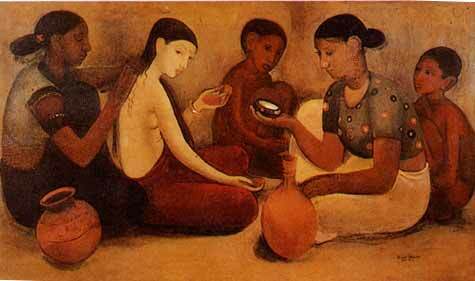 Amrita lives in each stroke of South Asian modern painting and continues to inspire the art scene rather profundly. More stories on Amrita can be found here and here. 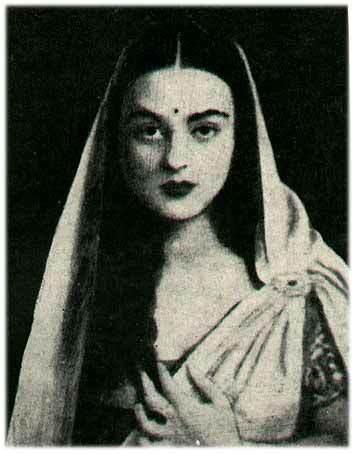 Do you know our film : AMRITA SHER GIL,AN INDIAN RHAPSODY ? Is this film available somewhere? subject,composition,expression & colour very powerfull paintings. subject,composition,expression & colours very powerfull paintings.